Today we truly live in a global society. At no time in the past has the world been as small as it is today. With the exploding use of the Internet and social media, we now have the ability to communicate freely with others all over the world. Communication is easy, fast and generally cost free. Likewise, travelling by air has never been so easy and inexpensive, allowing people from all walks of life to live, work or travel overseas. As a result, more and more people globally are committing themselves to studying foreign languages. They recognise that foreign language learning is not just a luxury or a pastime; indeed, it is a necessary skill in order to communicate and compete in a global economy. That said, learning any foreign language is a big challenge and success varies according to your time allowance, your resources, and your motivation. You should be aware that truly mastering a foreign language requires time, patience, effort, self-belief and a whole lot of dedication. Also, to successfully master any new language you need to have the right mindset. Without the right mindset you will possibly not succeed, or it may take you a great deal lot longer than is necessary. With this in mind, here are 7 key points to consider before you start your language studies. Will understanding your new language help you in your job? Will it allow you to enjoy yourself more when you travel to different countries? Will it help you better understand your ancestral culture? Do you have friends or relatives that speak the language? Was it your parents’ or grandparents’ native tongue? 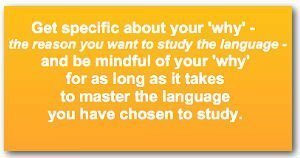 It is important to be very specific as to why you want to learn the new foreign language and constantly remind yourself why learning the language is important to you. Always remember that other people have learned new languages and so can you. Often the largest single barrier to success is the fear that you will not fail. The tip here is to stop asking yourself if you can really do this. Accept the fact that you are a capable, intelligent individual and you are going to learn a new language. Period. Let’s face it, if your life depended on it, you would have no excuses and you would master the language in no time. We spoke about this point in greater detail in a previous post. #3: Learning a New Language Takes Time – Accept it! You should understand that it will be necessary to devote quite a bit of time to learning your new language. People have proven that it is possible to become fluent in a new language in as little as 3 months, but doing so always takes a real concentrated effort. If you really want to or must learn a new language in a very short timeframe, you must be willing to breathe, eat and sleep the new language in order to accomplish your goal. Before you start your journey to mastering a new foreign language, set specific, measurable, attainable, relevant and time-based goals (S.M.A.R.T goals). This will help you to stay focused and motivated, and ultimately be more successful. Listen to and use your new language at every opportunity. Every time you have the chance, engage in conversations using your target language. Arrange to be in regular contact with people that speak the language fluently and who will be happy to help you. And if you are not in a position to surround yourself with people who speak your target language (by studying abroad, for example) find a good language school and make sure there is plenty of opportunity to practice speaking the language. You could also make use of the Internet to find foreign language speakers who are willing to help practice your target foreign language. For example: The Mixxer is a free educational website designed to connect language learners around the world so that everyone becomes both student and teacher. Alternatively, find language exchange partners on platforms like Skype’s Language Learning Community Forum. Meetup.com is another useful website you can use to find like minded language learners. If, for example you are learning Chinese, you could check here to see if there are any Chinese language & culture meetup groups . Also, be sure to watch foreign movies and TV shows (preferably with subtitles) and listen to radio stations and podcasts that are broadcast in the language you wish to learn. It will help you greatly if you take a multifaceted approach when learning your new language. Start by reading books or following some of the top Internet language learning bloggers about how to learn new languages. Next, try reading newspapers, magazine articles or even books that are actually written in your new language. Perhaps starting off with children’s books will inspire you to greater heights. There are many good audio programs designed specifically to teach your new language and these can also be very useful to get you started. The trick is to keep your mind absorbed in your new language by utilising as many possible resources as you can in the learning process. Don’t just try to learn the language, but also aim to learn about the people, the history and the culture of your target language. This may be one of the most important mindset tips of all. For instance, if you are learning Cantonese Chinese in Hong Kong, doesn’t it make sense to learn about the Hong Kong Chinese people and to understand their history and their culture? When you do it will create within you an even bigger desire to learn the language. Similarly, if you are learning Korean, for example, why not spend some time in Korea or even learn where the Korean speaking community is –if there is one – in your neighbourhood. Getting to know the people and understanding their true nature is a powerful motivator and perhaps the biggest key to language learning success. Interest in another language or culture, or intrinsic motivation, has been shown to be the most effective motivation for learning another language, even more effective than career opportunity or advancement. Anyone learning a new language is bound to make lots of mistakes. 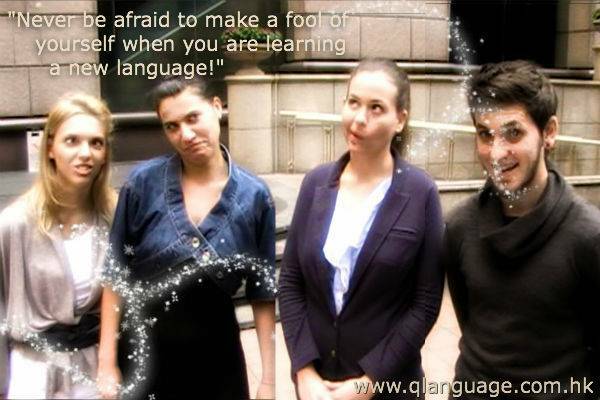 At times you may feel foolish or even believe that you appear childlike to those who are native speakers. However, understand that, in most cases, these people want to help you. To accept their help, though, you must learn to laugh at your mistakes not take yourself too seriously. Agreed, it’s sometimes easier said than done, but try not to be shy of making a fool of yourself. progress much faster than those who are afraid of making mistakes. Remember, if you allow your ego to be seriously bruised each time you take a step and fall down, you will soon refuse to take new steps. When learning a new language you must understand and accept that falling down is merely part of the process. Learn to laugh at yourself, shake it off, and then get up and take the next step. 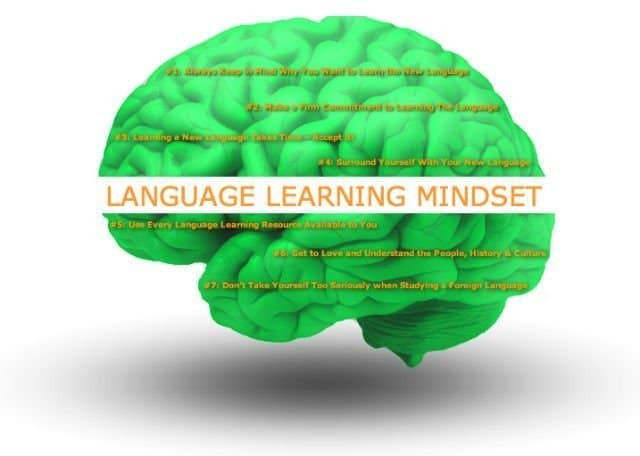 As you begin your journey, we hope these 7 language learning mindset tips will help you to enjoy the process as you work to successfully master a new foreign language. Thank you for your kind words, Priyanka and well done for writing such an informative article yourself. Keep up the good work!